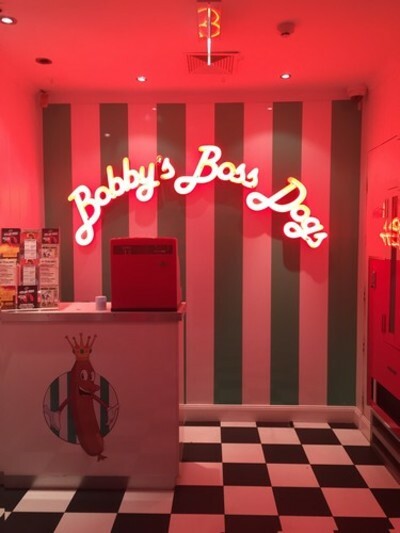 Bobby’s Boss Dogs on Wentworth Avenue with its neon lights, black and white checkered floor and vintage Cola vending machine screams kitsch. A handle-bar moustachioed man behind the counter, a bright red cash register and a menu perched on the wall complete the guise. It's all just a ruse. Pull the handle on the vending machine though and you’ll feel a little like Alice going down the rabbit hole. Bobby’s Boss Dogs is nothing more than a cover. Owner Graham Cordery initially wanted The Soda Factory concealed by a New York style pizzeria, but fellow Surry Hills bar, Frankie’s, beat him to it. Ultimately this worked out quite well though as The Soda Factory’s gourmet hotdogs and their Dollar Dog Tuesday’s have become somewhat of a Surry Hills institution. Inside, the bar is a big departure from the loud neon glow of Bobby’s Boss Dogs. Small wooden tables fill the large industrial expanse and along the walls, large, plush lounges with intricate carved detailing make for an ideal spot for big groups. Tea lights in mason jars, prints from classic films, pin-up girl posters and a shiny white Vespa complete the much more subtle ode to the ‘50s. 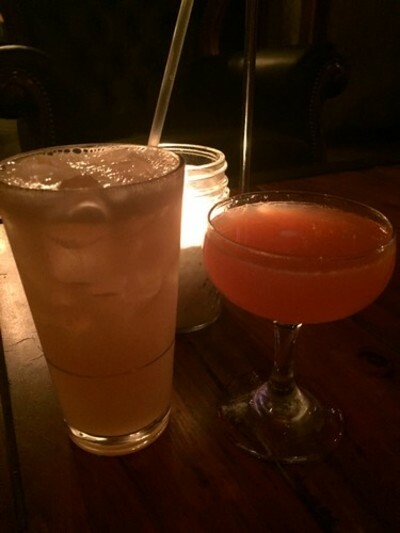 Sample a classic, or try one of The Soda Factory's own fruity concoctions. The bar at The Soda Factory is well stocked with a collection of wines, ciders and both international and domestic beers. The real focus here though is on the cocktails ($17-$20), with all the classics present, as well as a collection of fun and fruity Soda Factory concoctions including ice-cream float cocktails ($14) that combine the best of childhood with adulthood. This spicy fried shrimp is a nice ode to the South. The food at The Soda Factory continues the American diner theme with ribs, sliders, fried chicken and hotdogs making up most of the menu. For a taste of everything The Soda Factory has on offer grab a few plates off the sharing menu and try a little of everything. 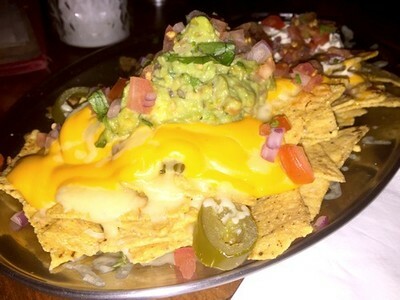 The nachos ($14) piled with refried beans, cheese, jalapeños, guacamole and sour cream are tasty and perfect for sharing. 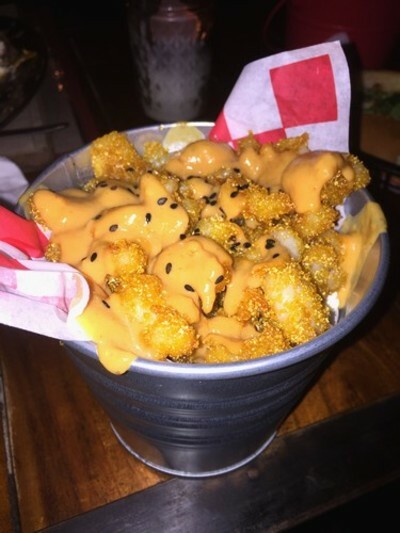 If you’re a little more adventurous go for the mac and cheese spring rolls ($11 for three) or the popcorn shrimp ($14); spicy, fried, juicy shrimp in a bucket of salty popcorn. Watch out for those jalapeños. 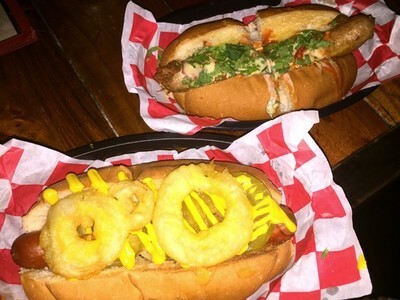 Be sure to grab yourself one of The Soda Factory’s gourmet hotdogs too (all $10), like the Buffalo Bill, a juicy chicken hotdog smothered in a spicy cheese sauce that packs a real punch, or the Frank Sinatra, generously topped with sauerkraut, pickles, mustard and crispy fried onion rings. Normally $10 dollars a pop, get in on a Tuesday though and you can have 10 hotdogs for $10. While the food, drinks, staff and ambience at The Soda Factory are all on point, there were a few issues that left rather a sour taste in our mouths. Firstly, due to a technical error of sorts there was a mix up in the kitchen which resulted in a wait of well over an hour for our meal, despite it being a quiet night, with some of the dishes arriving much before others, and others not arriving at all. In fairness, once informed, the apologetic staff were quick to resolve the issue. Secondly the kitchen seemed to be out of many things, including the pork ribs and ice-cream – so no salted caramel oreo cookie shake, or dessert of any kind actually. The novelty factor is high at The Soda Factory and the theme, followed through to a T, along with weekly events including movie Monday’s, live music and open stage nights throughout the week give the place a great vibe and a whole heap of character. The staff are friendly and the drinks and food, when they do finally arrive, are pretty great also. All-in-all it’s easy to see why the The Soda Factory has quickly become one of Surry Hills' main haunts. Where: 16 Wentworth Avenue, Surry Hills, 2010. When: Monday - Friday 5pm - 3am. Saturday - Sunday 6pm - 3am. Kitchen closes at 10pm daily. 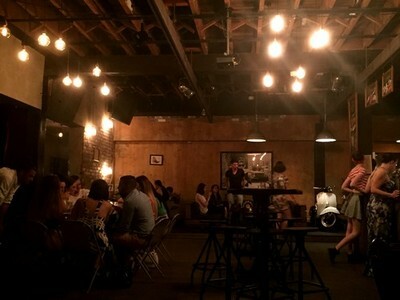 Good for kids: No, The Soda Factory is much less a diner than it is a bar.